The Cullmann Magnesit Copter Mini Tripod with CB-2.7 Mini Ball Head doubles as a tabletop tripod and as a handheld support for a DSLR, point & shoot, or compact camcorder. The legs are rounded on their outer side, so the closed tripod provides a comfortable hand grip. When folded open, the tripod & head sit 6.5" high on a table or other flat surface. Composed of aircraft-grade aluminum and anodized a matte black, the Copter supports up to 2.5 lb and weighs only 0.6 lb. The included CB-2.7 Mini Ball Head features a reversible mount: on one side is a standard 1/4"-20 camera screw, and on the other is a shoe mount for mounting an off-camera flash, LED panel, or other compatible accessory. The single knob of the head enables both the ball positioning and the pan movement. Box Dimensions (LxWxH) 10.0 x 4.6 x 2.0"
Magnesit Copter Mini Tripod with CB-2.7 Mini Ball Head is rated 4.7 out of 5 by 58. Rated 5 out of 5 by Maryse from Little Gem I bought this little mini tripod for traveling. It's perfect for my needs. Small enough to fit inside my camera bag and super light to carry. It's also really sturdy as well. I can mount my Canon T3i with battery pack and my heaviest lens which is a Tamron 24-70 with no problems. I've also used it as a slider (on flat surfaces) thanks to the rubberized ends on each leg. The build is solid and it's a good quality product. Just an all around great addition to my camera gear! If you are on the fence about buying this product, rest assured that you are buying something that is well made and will last you forever ....you won't regret it!! Rated 5 out of 5 by John from Awesome Desktop Tripod I mainly use the Copter Mini to videotape watch reviews that I put on YouTube. Ten year warranty, who gives their products a ten year warranty, nobody that's who. I like that it comes with a ball head which lets you position camera Lumix ZR3 in multiple positions. 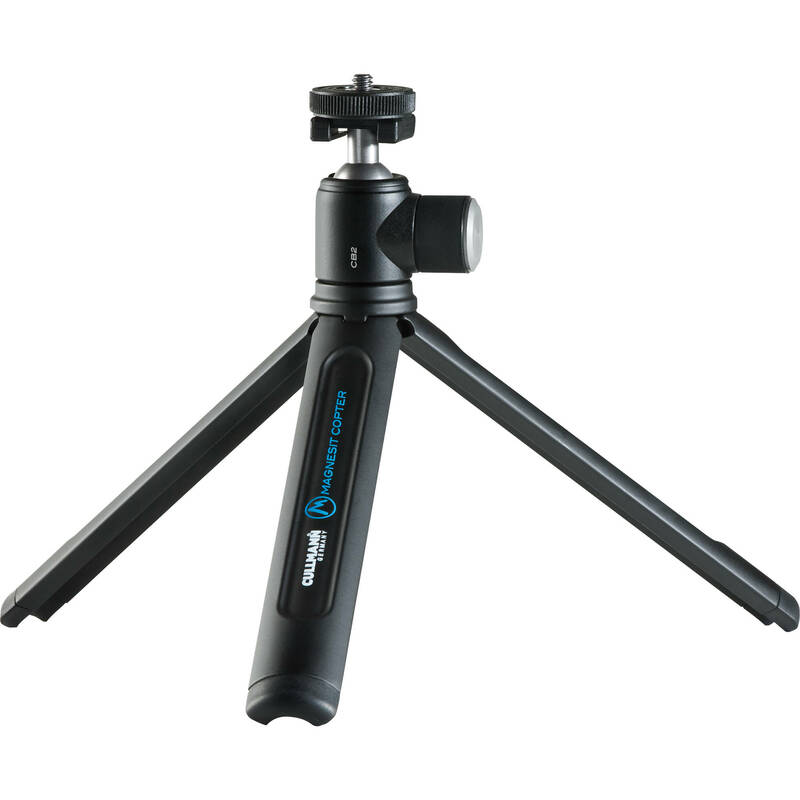 The tripod is very lightweight you won't notice it stowed away in a backpack or even a pocket. The ONLY thing that I didn't like about the Cullman was that the middle section wasn't tall enough. I'll stack the Magnesit Copter on some books for that extra height that I need. Overall this tripod is well worth the small change you'll shell out to purchase it. Did I forget to mention that it has a TEN year warranty. Rated 5 out of 5 by JoeTheProducer from Excellent product, plus extra way to use it. Solid feel. Light weight. Clean design. Flip option on ball head plate. Liked it when I held it in my hands. Liked it when I mounted an LED light for some test shots. Then is struck me. If I put a velcro strap around the handles when they're closed, I can slide it over a bar of any height. Since I have mic stands in my studio, I picked a boom stand, placed the boom upright to about 5 feet. Slid the closed Cullmann tripod over it, and voila! Keep velcro straps handy if you don't already. 1/4 wide by 6 inches. Just peel it off the roll, wrap it tight around the base, or lower part of the legs, and when you're ready to use the Cullmann in the conventional way, just slide the strap up to the legs. You don't even have to take it off, and it'll be right there for it's next use. Rated 5 out of 5 by Dmitry from Copter tripod by Cullmann I was looking for an ultra compact tripod that can be taken on trips without a need for large backpack or bag. I've been using Ultra-Pod 2 before and it did the job with my Nikon D50/18-200 lens... sort of. I had to hold the legs at all times to secure the setup. It also had a bit of a flex due to its' plastic body. All this was cured by the very solid, aluminium Copter. It offers stability and security plus all the benefits of a nice, metal ballhead for a very, very reasonable price. It even allows for panoramic rotation when not fully tightened. Rated 5 out of 5 by Dorian from Portable, solid and stable. Perfect table-top tripod! Can't say enough good things about this mini-pod. I bought one and then immediately bought another! I keep on in my bag and one in my studio. Pretty much the perfect solution for this sort of tripod. I only wish Cullmann had a version like the DJI Osmo tripods, where a second length of leg could rotate out from under the primarly legs offering a wider base: for even stabler shots using heavier cameras. With smaller tripods there is never enough stability for heavier cameras systems with non-centered masses. I guess they'll add that in their Magnesit Mini-WIDE Tripod model? : ) Highly recommended! Rated 4 out of 5 by Anthony from Small and convenient I bought this tripod to supplement a larger, full sized one. It has proved to be very useful, and can handle more weight than advertised. I can mount a 5d3 with 50l and it will support it effortlessly. But my 1d with 24-70 can't be supported by the ballhead, and I never expected it to. I just wish the plate on the ballhead had a rubber liner or grommet of some sort to keep it seated to the camera, otherwise would've been a 5-star rating. Rated 5 out of 5 by JoeTheProducer from Can be used in creative ways. Solid feel. Light weight. Clean design. Flip option on ball head plate. Liked it when I held it in my hands. Liked it when I mounted an LED light for some test shots. Then is struck me. If I put a velcro strap around the handles when they're closed, I can slide it over a bar of any height. Since I have mic stands in my studio, I picked a boom stand, placed the boom upright to about 5 feet. Slid the closed Cullmann tripod over it, and voila! Keep velcro straps handy if you don't already. 1/4 wide by 6 inches. Just peel it off the roll, wrap it tight around the base, or lower part of the legs, and when you're ready to use the Cullmann in the conventional way, just slide the strap up to the legs. You don't even have to take it off, and it'll be right there for it's next use. Does this have the cb 2.7 ballhead? It's listed as CB-2. Trying to figure out what's the difference? Yes, it is the same. Note however that the legs are rated up to 5kg but the head is only rated up to 1kg, so if you have more than a compact camera or small mirrorless setup you probably want to replace the beall head with something a little more substantial. I have a Nikon D750 along with the following lenses - Nikon 24-120mm F4, Nikon 70-300mm F4.5/5.6, Nikon 85mm F1.8G, Nikon 50mm 1.8G, and a Nikon 20mm F1.8. I'm sure they'll be no issues with the primes. Any issues using this tripod with either of the zoom lenses? I've also been considering the Slik Mini Pro DQ. i have used the 70-300 without issue but with a slightly lighter body. i hope this helps. does it fits for canon SX60 ? Yes. The Canon SX60 has a tripod socket on the bottom that you can use to attach to this mini tripod.